The flames broke out in Gordon Street in Leith at 12.21pm on Thursday. 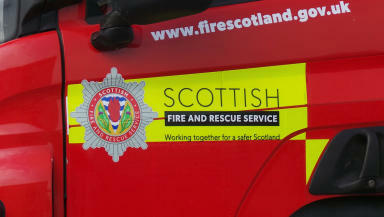 A man has died after a fire broke out at a sheltered housing flat in Edinburgh. Crews were called to Gordon Court in Gordon Street in the Leith area of the city at 12.21pm on Thursday. Firefighters entered the property and quickly put out the flames. A man, who was in the home at the time, died in the property. A spokesman for property managers Bield Housing and Care said no-one else had been injured in the fire and there was no evacuation from any other flats. He added: "Staff on site, who followed all correct procedures, are continuing to provide support to other tenants. "It is a tragic situation and our sympathies go to the relatives and friends of the tenant." A joint investigation will now be carried out by the police and fire service.